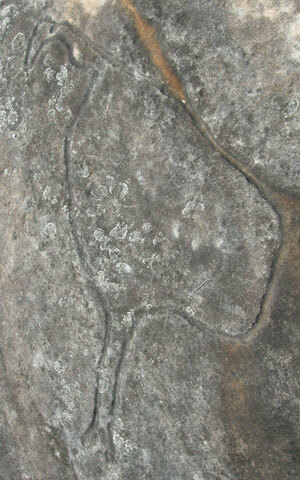 On a rock platform in Ticehurst Park at Faulconbridge an Aboriginal rock engraving holds the memory of a long vanished inhabitant of the Blue Mountains. Three emus are portrayed, possibly in the course of being hunted. 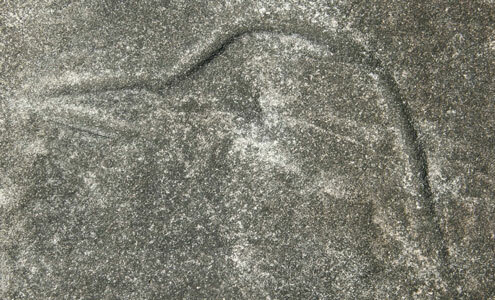 There are tracks depicting movement and one emu lies in a prone position. 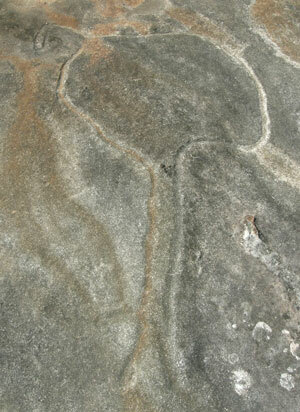 Evidence of the emu's importance to the local Aboriginal people, this rock art site is a powerful reminder of loss - on multiple levels. Among the First Fleeters the emu (or 'cassowary' as it was called) was, said Watkin Tench, "the bird which principally claims attention". It was shy, fast and difficult to shoot and its flesh tasted like beef. In 1790, in the wake of exploration by Tench and fellow Marine officer William Dawes, a survey party "saw three Cassowaries" in the vicinity of the Nepean ford and Emu Plains was christened. Though emus in the coastal regions soon fell victim to the gun and dog, they were still surviving in the less accessible terrain of the Mountains when Gregory Blaxland camped near present-day Springwood in May 1813 and had his sleep interrupted by one "on the other side of the gully calling continually in the night". During the next couple of years explorer George Evans, road builder William Cox and Governor Lachlan Macquarie all remarked upon the abundance of emu in the newly discovered country west of the Mountains. From this time on, however, the record traces clearly the emu's retreat before the advance of settlement, with colonial observer and naval surgeon Peter Cunningham forecasting in 1827 their demise as a species, "possibly spoken of hereafter … as part and parcel of traditionary (sic) history". Even on the Bathurst Plains where Evans had found large flocks and declared them "numerous" in 1813, their numbers soon declined; so significantly that Charles Darwin (1836) was constrained to lament that "the emu is banished to a long distance", a view reiterated three years later by Louisa Meredith who, while staying with her sister in Bathurst, wrote that "now these noble birds have become unknown, except in the almost untrodden districts of the interior". 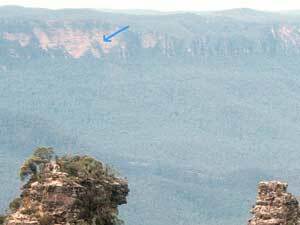 In former times visitors to Echo Point would sometimes play a 'spot the emu' game, seeing who could first locate the shape of an emu in the weathered sandstone wall of Kings Tableland. 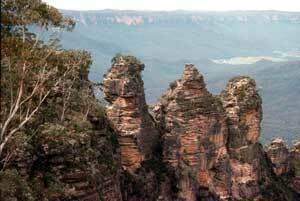 Known to the Aboriginal people, the indigenous importance of this feature is attested to by the survival of a legend – "The Crushing of the Emu" – one of two emu legends collected in the 1940s by journalist and bushman Frank Walford from Gundungurra man Jimmy Shepherd (see Jim Smith, Legends of the Blue Mountains Valleys, Den Fenella Press, 2003). Best viewed "lit by the westering sun", further weathering has made the figure more ghostly and difficult to decipher but with good eyes and a bit of imagination you might see what Walford himself saw – a large bird gazing "backward over its left shoulder, as though disturbed by some noise in the lower reaches of Kedumba Valley". Another reminder of what's been lost! The article above first appeared in the May, 2014 edition of Hut News.